You remember a few months back when Pinterest rocked marketers' worlds by introducing business accounts? Here's what Pinterest's analytics tool looks like, and how to use it! Get excited, people. Who Can Use Pinterest Analytics, and Where the Heck Do I Find It? 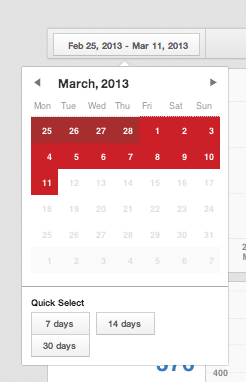 First of all, Pinterest's analytics tool is totally and completely free of charge. It is available to you right now, as long as you've verified your account. That is to say, you can't use your personal account -- you must have a business account. If you haven't verified your business account yet, visit this blog post to learn exactly how to do it. Now that you have the new look, you'll be able to get access to your verified account's analytics. Just go back to that drop-down menu, and you'll now see "Analytics" in your menu. Click on it, and BOOM! Pinterest analytics! Right at your fingertips. What Can I Find in Pinterest's Analytics Tool? See that? 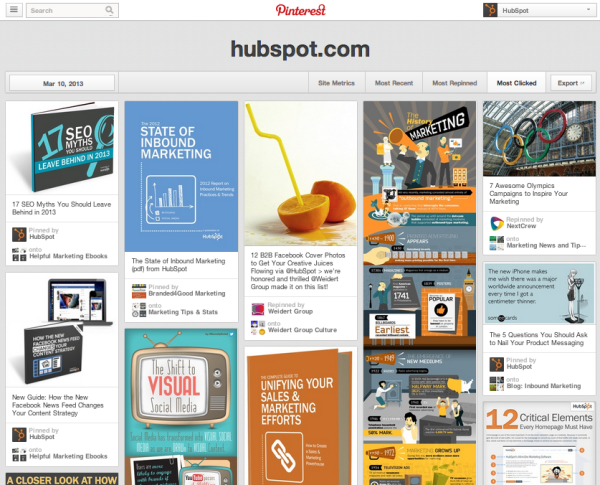 All of the pins you've pinned that get clicked on the most frequently. Guess this is some pretty popular content you're posting! You'll also notice that you can adjust the timeframe for any of these metrics, so you can get a snapshot of a day, a week, or a month, to help you align with any marketing campaigns you might be running. All of these metrics can also be exported to a .csv for further analysis, if that's what tickles your fancy. Well, because it's data. Duh. But really, it's a pretty cool first step, because marketers using Pinterest have had to pay third-party providers to get analytics on their Pinterest marketing up until this point. Now, those third-party providers are still providing way more robust analytics than Pinterest's free tool, and the Pinterest API is still closed according to AdAge, so developers can't start building applications to take advantage of the data. But this is a promising first step, to be sure. 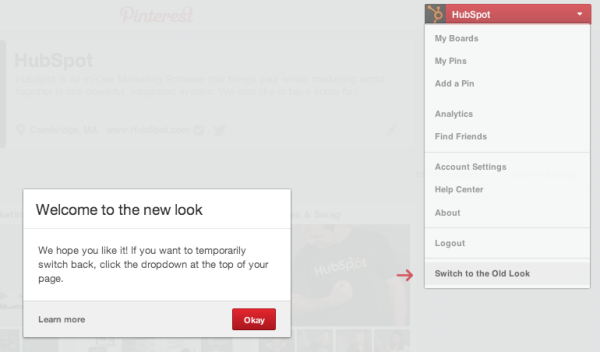 It also paves the way for an ad platform appearing on Pinterest. Most social networks have learned from the mistakes of their social networking brethren -- ads without analytics do not bode well for long-term monetization efforts. If marketers are going to spend money on social advertising, they need to know if it's working. And analytics does that. So if I was a betting woman, I'd say stay tuned for a Pinterest ad platform in the near future. Finally, Pinterest's analytics tool is just going to make marketers' content and social strategies even stronger. When you have data to back up the choices you're making and inform future decisions, you're empowered to eliminate a lot of the guesswork that comes with social media marketing, and make content choices that have a proven track record of success. For instance, ecommerce marketers could use this information to figure out which products they're pinning drive transactions -- it could even help inform what products they stock. In fact, it might interest marketers to know that Pinterest buyers spend more money, more often, and on more items than any of the other top five social media sites, according to comScore. You might not even be interested in transactions ... maybe you're debating the merits of Pinterest entirely. With these metrics, you might uncover a secret Pinterest superpower you didn't even know about. 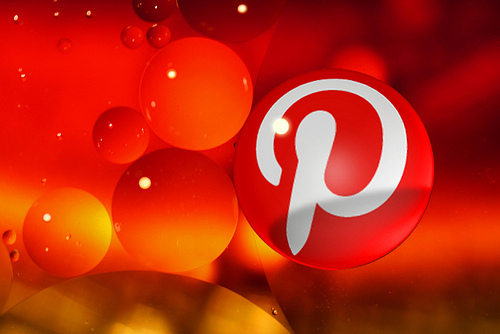 Perhaps unknowingly, Pinterest has been really fantastic at branding, for instance. With impressions as a metric, it's much easier to attribute that often immeasurable branding "boost" to your rocking Pinterest account. Marketers could even glean which days of the week are best for pinning certain content -- for instance, are B2B marketers seeing their infographics fall flat on weekends? Or perform way better? Could go either way, right? Now, you have the data to know for sure. 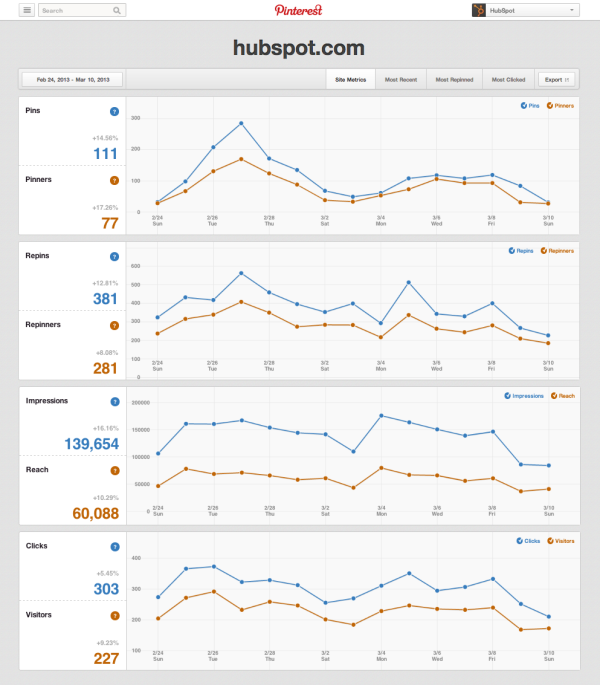 Are you excited about Pinterest's analytics tool? What other data would you like to see in the tool?